HealthymouthTM has 46 dental care products and ALL 46 have been awarded the prestigious VOHC Seal of Acceptance for plaque control in dogs and cats. 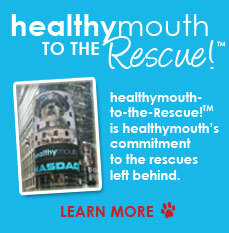 HealthymouthTM is the FIRST and ONLY dental water additive and topical gel awarded the seal. To read more about this award click here. The VOHC Seal, recognized worldwide, assures pet owners that they are getting a superior product, tested and proven to be effective against dental disease. To learn more please visit www.vohc.org. In two independent clinical trials, performed with rescued blood donor greyhounds, under the supervision of renowned scientist W. Jean Dodds, DVM, healthymouth anti-plaque water additive for dogs reduced plaque by a remarkable 71.9% and 76.7% without any artificial enhancements. In two independent clinical trials, performed with rescued cats from The Kitten Rescue LA, healthymouth for cats reduced plaque by an equally remarkable 85% and 88% without artificial enhancements. The topical gels for dogs and cats are also backed by clinical science producing equally excellent results. Plaque indxes can be viwed on this website under "Clinical Trial." 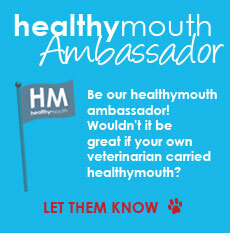 HealthymouthTM has a growing following of the leading Board Certified Veterinary Dentists recommending healthymouthTM to their patients throughout the U.S. And Canada. To learn more about veterinary dentistry and to locate a veterinary dentist near you, please click here. HealthymouthTM is very proud of its ingredients. Please click here to see ingredients. The formula contains no fat, so sugar and no sodium (gels contain sodium). It has been proven safe on more than 900 greyhounds over a three- year period, 4000 client owned dogs and 2000 client owned cats. Take a look at healthymouthTM and the other dental water additives currently available on the market. Which product would you prefer to have your pet ingest every day, potentially for the rest of his life? Simply added to your pet's drinking water every day or simply applied to teeth and gums once per day what could be easier than healthmouthTM Easy pour jugs and one-handed tubes means no mess, no fuss. 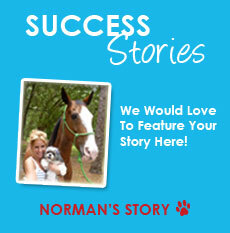 Easy to travel with so your pet never has to miss a day of essential home dental care. Used in conjunction with veterinary examination and professional dental cleaning, you can proactively prevent or improve your pet's bad dental health overall health by making healthymouthTM the foundation of your pet's home care program. We firmly believes that the MORE you can do at home, the better. Tooth brushing remains the gold standard though less than 2% of owners brush their pet's teeth. Many owners say their pets do not like having their teeth brushed. Pets DO NOT have an aversion to a toothbrush, but if their mouths are in pain, of course they won't welcome a toothbrush. But when you pet's mouth starts to feel better, he will let you near and in the mouth. Clinical trials showed that when healthmouthTM is used continually, any remaining plaque in the mouth becomes so soft, it can literally be wiped away. What this means is that healthymouthTM, used in conjunction with teeth brushing, healthy dental chews and bones and diets can produce increased results and be easier for you!